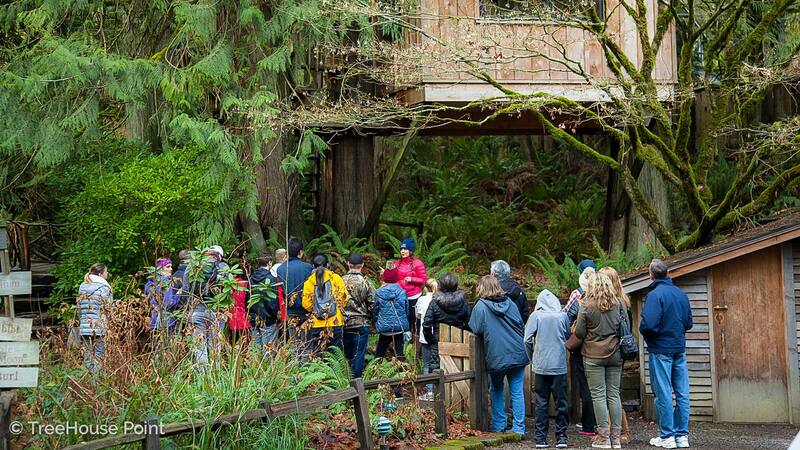 Come take a tour of the TreeHouse Point treehouses! Tours take approximately 1 hour and we aim to take you inside as many of our treehouses as possible, based on availability. In order to protect the privacy of our guests and ensure that our many scheduled events are uninterrupted, visits to the property must be scheduled in advance. Tours are conducted year-round and take place regardless of weather. New dates are added at 2 pm Pacific Time on the first Tuesday of the month prior. For example: March tour dates will be available at 2 pm Pacific Time on Tuesday, February 5th. *Although we strongly recommend the tour for ages 4 and above, all ages are welcome. Infants must be held in carriers the entire tour, and do not need a ticket. Any child who will be walking must have a purchased ticket. There may be multiple tours offered on the same date. Prior to purchasing your ticket, please confirm that the date and time you have selected for your tour is correct. All tour attendees must check-in for tours in the Lodge. Please arrive no earlier than 15 minutes before your scheduled tour begins. Parking is extremely limited and carpooling is required. Pets, including dogs, are not allowed on our property, including on-site in your vehicle. All tour attendees must stay with their tour guide at all times while on the property. Tours do not coincide with guest stays, rather they are conducted in the time period between check-out and check-in when the treehouses are unoccupied. To find available tour dates and get tickets, click here. We hope you can come "Be in a Tree" with us soon!